This clubby, upscale steakhouse chain dishes up buttery steaks to a well-heeled Beverly Hills crowd. : Think juicy steaks served sizzling in a pool of butter --- that's what put this upscale New Orleans-based steakhouse on the map. Despite the rapid growth of this worldwide chain, the experience never feels mass-produced. 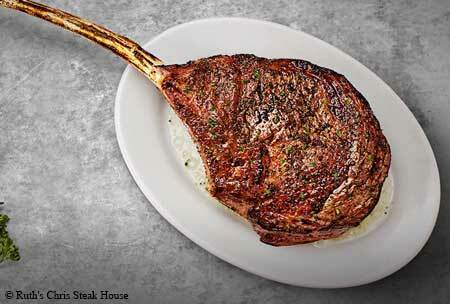 You can order veal, lamb, chicken or fish, but we suggest sticking with Ruth's Chris' hand-cut U.S.D.A. Prime Midwestern filet mignon, rib-eye, New York strip or porterhouse steaks. For those so inclined, the blue cheese crust is a memorable embellishment, and sides range from a variety of potato selections to giant asparagus spears with hollandaise sauce. Recommended starters include New Orleans-style barbecued shrimp and “crabitini” in a martini glass. While steak is surely the star here, the Maine lobster is also first-rate and desserts --- consider the signature chocolate chunk bread pudding with whisky sauce --- should not be overlooked. The wine list offers plenty of big reds to complement those hearty steaks. The newer Ruth’s Chris restaurants, forced to compete with hip contemporary steakhouses, feature more modern architecture. But this branch is comfortably old-school, with red leather booths, generous wood and white linen. Other locations.